What is a Wrist Rest or Palm Support? A Wrist Rest or Palm Support is a object with padding (foam, gel, etc.) which can be placed on a hard surface to soften a firm surface. It can also provide support, increasing the elevation from the worksurface if the current height of the worksurface is too low. What is the Difference Between a Wrist Rest and a Palm Support? The primary distinction is usage. A Wrist Rest is a device that one rests their wrist upon, i.e. the area below the palms of the hands where there are lateral creases in the skin. A Palm Support is a device that the fleshy portion of the palms can receive support from without placing pressure upon the wrist. The physical product is the same - what determines whether is different is the usage of the product. In the vast majority of cases, Wrist Rests do not provide any significant ergonomic benefit and in fact will usually increase the number of risk factors for injury in the computer workstation. The reason is that if an individual rests their wrists on any type of support, regardless of material, pressure is applied to the underside of the wrist. This will apply pressure to the area, often resulting in decreased blood flow to the hand. More specifically, you can compress the carpal tunnel and possibly pinch the median nerve, which can lead not only to long term injury, but short term symptoms such as tingling, numbness or coldness in the hands, and finger muscles which fatigue quicker due to reduced circulation. 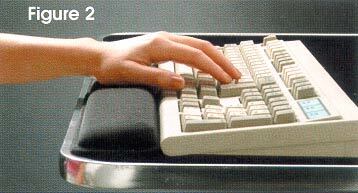 Palm Supports are usually ergonomic in that they provide support for the palm during periods of inactivity (i.e. when there is no active typing or mousing). This can assist in reducing the tendency to 'drop' the hands, which can lead to a position of Wrist Extension. However it is critical that the support has a sufficiently low profile so that the wrist does not rub on the rest when the mouse is moved forward (i.e. move the cursor up) or reach for the upper rows on the keyboard. In other words, the Palm Support when uncompressed should be level and not be higher with the front edge of the keyboard housing or the mousing surface to prevent any pressure on the underside of the wrist. Here is an example of Wrist Extension (Dorsiflexion) caused by the dropping of the palm / hand while keyboarding. With the use of a palm support, the Wrist Extension has been prevented. However if you look closely you will see that when the user reaches for the upper rows of keys on the keyboard their wrist will catch on the wrist rest. If the front edge of the keyboard was raised (for example by placing erasers at the front) this would likely reduce the risk factors associated with using the palm support further. Do Using Wrist Rests / Palm Supports on a Keyboard Increase the Reach to the Keys? 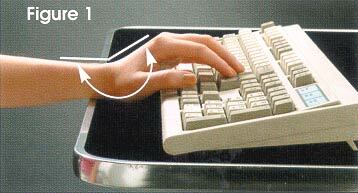 Some suggest that a palm support which is attached to the keyboard will increase the distance that the user has to 'reach' to get to the keyboard. This is not the case as the position of the palm when typing is typically 1-3" in front of the keyboard (depending on which row of keys are being typed on). The presence (or absence) of a palm support will not increase the distance one has in having to 'reach' to get to the keyboard. The only exception would be for individuals with very small hands or extremely limited reach (i.e. atrophied limbs). In this case the palms of their hands are likely over the keyboard at all times when typing as the traditional typing posture is not an option for these individuals.